What is real? What are lies? What is truth? Are you confused? There are some absolute truths. Rebekah Williamson is a Nationally Certified Sign Language Interpreter with an advanced level through the Registry of Interpreter’s for the Deaf. She has also been working in Children’s Ministry for fourteen years. Rebekah has written the curriculum for four Vacation Bible Schools as well as numerous skits and plays. 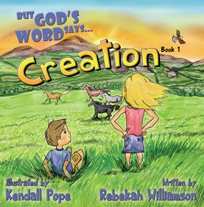 Rebekah has a passion for writing children’s books and hopes to educate children on fundamental Biblical principles with her books. Rebekah currently resides in Georgia with her husband and 3 children. Kendall Pope is a freelance writer and illustrator. He volunteers in his local church in various teaching and creative activities in the children’s and youth ministries. Kendall is also the creator of Sketchers Ink, a program that promotes the artwork of children and youth in ministry activities. He currently resides in Georgia with his wife and daughter.